Will Eisner's classic comics character makes the leap to the screen in this spectacular new live-action movie written and directed by Frank Miller (Sin City, 300), and starring Gabriel Macht as The Spirit, Samuel L. Jackson as his psychotic arch-nemesis The Octopus, and Eva Mendes and Scarlett Johansson as alluring femmes fatale. This stunning volume contains interviews with the cast and the crew, color photos & production art, and Frank Miller sketches and storyboards. The Spirit: The Movie Visual Companion, published by Titan Books, also features loads of Will Eisner sketches and art that inspired the new movie. Please note: The movie release date on the widget is the UK release date for Will Eisner's The Spirit. "Will was still very productive near the end of his life," says Carl Gropper, archivist of Will Eisner Studios, Inc., in New Jersey. "I suspect that now that the new movie based on his work is coming out, there will be quite a bit of additional interest in his remarkable career." An adaptation of Eisner's most famous work, "The Spirit," comes to the big screen Christmas Day. 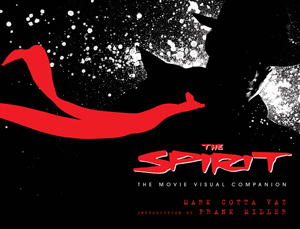 Frank Miller's film version of Will Eisner's innovative 1940s comic book, "The Spirit" opens on Christmas Day. It will be stylistic and hyper-visual, a hoped-for perfect melding of film and "sequential art," a term coined by Eisner. What it will not be, however, is revolutionary. Comic book movies are now the meat and potatoes -- not to mention several side vegetables -- of Hollywood. And even its green screen, scene-simulation style is just part of a Miller continuum that started with "Sin City." But if the world had turned a little differently, if fate had been a little kinder, a "Spirit" feature film would have debuted in the 1980s that would not only have been revolutionary but -- those of us involved in it were convinced -- a huge hit, possibly the first $100 million-grossing animated feature. And the futures of such filmmakers as Brad Bird, Gary Kurtz, John Musker and John Lasseter might have taken alternative paths. SAN DIEGO - Comic-Con International, the largest comic book and popular arts event in the United States, announced today that submissions are now being accepted for consideration by the judges for the 2009 Will Eisner Comics Industry Awards. Publishers wanting to submit entries should send one copy each of the comics or books they wish to nominate and include a cover letter indicating what is being submitted and in what categories. There are no entry fees for any submissions. Continue reading Eisner Awards 2009: call for entries.